Base of Operations: Unidentified location within the U.K.
Powers/Abilities: Robert Arnold could spontaneously combust with a large accompanying explosion of energy which severely burned anyone too near to him. Though it wasn't explicitly stated that he could only use this power a single time because it was fatal to Robert, it seems probable. 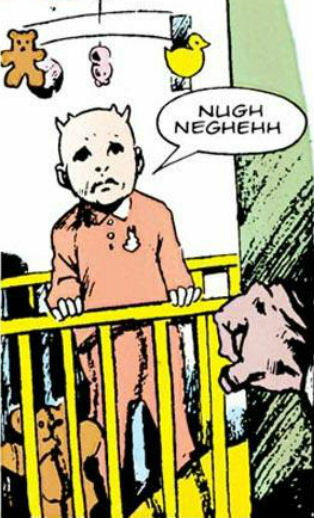 History: (Captain Britain II#9) - Robert Arnold was a young child, barely old enough to stand up on his own, with horns on the top of his head. 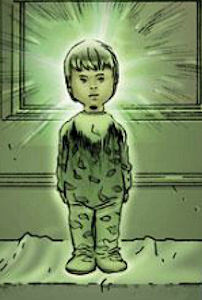 He was located by RCX during their sweep for Warpies, and Agents Gabriel, Michael and Joshua were sent to retrieve him. Mrs.Arnold, his mother, was understandably distraught by this, but not as distraught as her toddler, who started to cry loudly when Joshua lifted him, and then spontaneously combusted in a highly explosive manner. Robert was presumably killed, but Joshua survived, though only just and badly injured. Robert was described as being a Warpie, but might conceivably have been a mutant instead, though they usually don't develop their powers until later in life. It's unclear if he was born with his horns and explosive power, or if he was transformed after birth by the Jasper's Warp. Robert has appeared twice, both in flashback to the incident that injured Joshua N'Dingi and resulted in him becoming a cyborg. 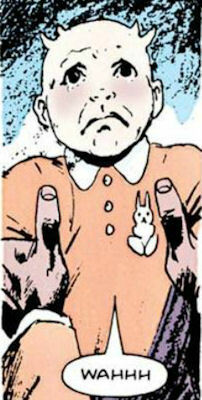 He looked radically different in his second appearance, in Astonishing X-Men: Xenogenesis#3, noticeably older and more human, with hair and no horns; presumably the first appearance (the one used above) is correct and the second (the one to the left) an error caused by the later artist lacking image references. However, if you want in-story reasons, then since both are memories, one or both might be misremembered. The first flashback was shared between Dr. Crocodile's mind and Captain Britain (Brian Braddock), so conceivably details such as Robert's appearance might have been subconsciously changed by the latter. Personally I prefer his original appearance, both because I'm not fond of changing established details due to unintended retcons, and because the original appearance was more unusual, and thus more akin to how Warpies were usually depicted, than the relatively normal looking child in Xenogenesis. It's worth noting that the reason why the African Joshua N'Dingi's hands appear white in the above images is because all the colors are a little washed out t signify that it is a flashback and, possibly, because Captain Britain was seeing himself in Joshua's place while experiencing the event that left Joshua injured. Other details of the revisited flashback are also modified, and while most can be considered simply additional information not shown in the original flashback, some cannot - however, these changes impact more on Dr. Crocodile than Robert, and so are discussed in his profile instead. One additional detail pertinent to Robert is Joshua's mention that he would be taken from his room and downstairs to see his "mummy and daddy," confirming the unseen presence of his father in the house. I've assumed above that the father is Mrs. Arnold's husband, and hence Mr. Arnold, but there is the possibility that she could have been widowed or separated from her husband, with a new boyfriend being Robert's father. (Captain Britain II#10 (fb)) - Mrs. Arnold was the mother of Robert, and was understandably distraught when men from the government came to take her infant son, even if he did have horns. Agent Michael held her when she tried to stop them, explaining that while he understood her feelings and wished there was another way, his people had the proper facilities to care for the child. (Astonishing X-Men: Xenogenesis#3 (fb)) - Another agent, possibly Agent Gabriel (Joshua described him as an engineer), also held her while Agent Joshua went upstairs to take Robert. (Astonishing X-Men: Xenogenesis#3 (fb) - BTS) - Mr. Arnold was also present when RCX came to collect Robert.